Tuesday evening it was time to try out the new Kuat Drive Yards flashpoint. I was curious to see if/to what extent my predictions about a lack of story would turn out to be correct. The introductory quest was actually pretty nice. I liked the little conversation you end up having with the Starfighter-only companions, as it gives them an actual presence in the game instead of them just being little pictures in your Starfighter panel. Getting to meet Fleet Admiral Aygo was neat as well, as I always love being able to put a face to a voice, and I'd heard his voice plenty of times before during the start-up of Galactic Starfighter matches. 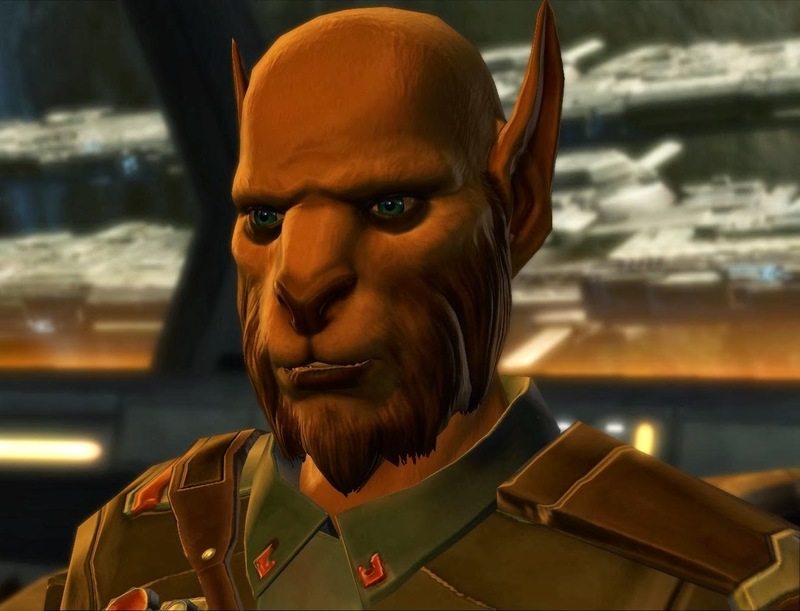 And what a cool-looking Cathar he is! I really like the elongated ears and funky beard. (EDIT: I'm being told that he's supposed to be a Bothan actually.) I was also pleased to see that the conversation with the Admiral and a little cut scene of ships flying to Kuat are actually part of the flashpoint. I don't care if it'll get old the tenth time, these little touches are what make the game what it is. My first run consisted of me on my main, pet tank on his, a guildie as dps and a pug from the group finder, who turned out to be another healer. We got the prison break and cannon destruction scenarios, and it was... pretty disappointing. Don't get me wrong, knowing that it was a story mode tuned to be doable without a tank or a healer, we didn't expect it to be challenging, not to mention how overgeared we were. But it seemed to be even easier than the Czerka flashpoints, weak mobs everywhere and barely a lone strong or elite mob to be seen anywhere (from what I could see at the time). It felt like it was tuned to be completely soloable for any reasonably competent and geared player, with the possible exception of the final boss, who has a lot of health you have to chew through if nothing else. Why even advertise this as group content? As we were just running around spamming 1 and the occasional AoE, we looked around and found both the environment and the story inside the flashpoint to be kind of lacking as well. There may be five different scenarios, but they all take place in generic space station rooms, and the story basically consists of the Fleet Admiral giving you a ten second voice-over of what you're supposed to do, which more or less always comes down to "kill stuff and click on a thing or two". There's also no loot other than some credits from the trash and a reputation token from each boss. When we got the "flashpoint completed" message, our pug piped up with: "That's all? Lame." I was curious however. Since the big advertising point of this new "tactical" flashpoint system is that it's not supposed to require a holy trinity and be accessible to all players from level fifteen upwards, I wanted to see what things were like on the lower end of that spectrum. So I logged onto the lowest-level character I have right now, a (then) level seventeen Vanguard, and queued her up. I got a group almost instantly. Doing the intro quest, I was pleasantly surprised to see that it had been tweaked a bit to fit into the lower level storyline, as the quest giver referenced a fear of the Imperials breaking the treaty of Coruscant (which has not yet been broken at the point where my trooper is in the story). My group consisted of a level fifty Shadow tank and two dps knights in the low thirties. Nobody capable of even casting a single heal. That was going to be interesting. The trash pulls were still easy enough for the most part, but with no heals whatsoever my health got dangerously low more than once. When we fought one of the mini bosses, the tank got so close to death that I taunted the boss off him for the last leg of the fight while hitting the single cooldown I had at my level. It wasn't exactly tough, but it wasn't nearly as mindless as the max-level run had been either. We had to pay attention to our surroundings and everyone's health levels. 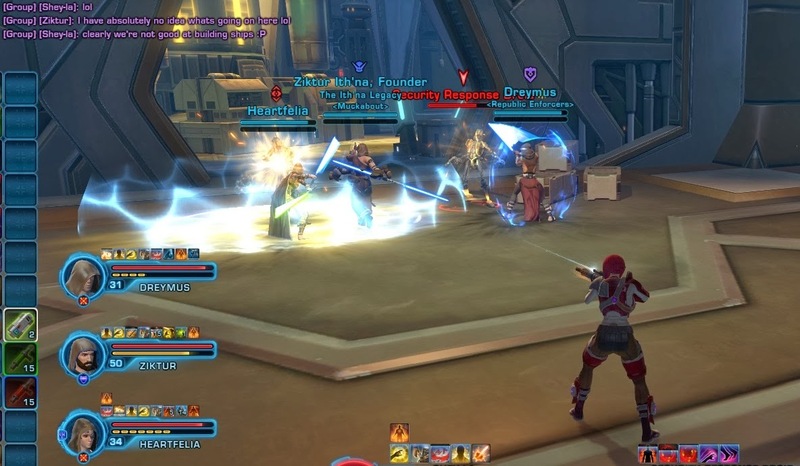 On the last boss we even wiped once, as we didn't immediately figure out how to deal with his grenade mechanic, and once we did, we initially split between the degaussing stations, causing them both to be on cooldown when we needed them again. We got there in the end, but it was pretty manic. The bolstering seemed to work well, though I was sad that I was unable to scavenge any of the mobs we killed as they were officially all matched to our bolstered (high) level. (Want to buy crew skill bolster?) I'm also not sure if the bolstering is working as intended with the kolto stations, as I seemed to get healed to full almost every time while our tank in particular hardly seemed to get any benefit from us clicking them, as if the healing output was somehow based on our real, unbolstered health or something. Still, that lowbie run (which incidentally netted me a whole level due to restedness) certainly changed my initial impression of the flashpoint. Or rather, it made me see the bigger picture. Bioware made a flashpoint that's supposed to be accessible to anyone from a full group of level fifteen damage dealers to a group of max-level characters forming a traditional party of four while filling all the different trinity roles. Even with bolster, the difference in power between those two setups is immense, regardless of whether we're dealing with a premade or a random pug. The developers decided to err on the side of caution and designed the flashpoint in such a way that even the worst possible randomly assembled group could do it. I can't honestly blame them for doing that, even if it means that at max level and with a group that has a healer it's pretty damn boring and I wouldn't bother beyond getting the initial quest done. But as a change of pace from lowbie levelling it seems pretty entertaining and viable, especially if you end up with a sub-optimal group make-up that forces you to think on your feet. And as for that whole story thing? Well, I appreciated the inclusion of a conversation and a cut scene, though the background for the different scenarios is a bit of a "blink and you'll miss it" affair. That said, after having done three runs of the place now, I'm starting to appreciate the randomness as a source of entertainment. It's quite fun to see which scenarios, mini-bosses and final boss you'll get. Oddly enough, this might be one instance where your experience actually improves the more often you repeat it, as you get to know all the different permutations and can see how it all goes together. Don't mean to nitpick, but Aygo is a Bothan, not a Cathar: Bey'wan Aygo. 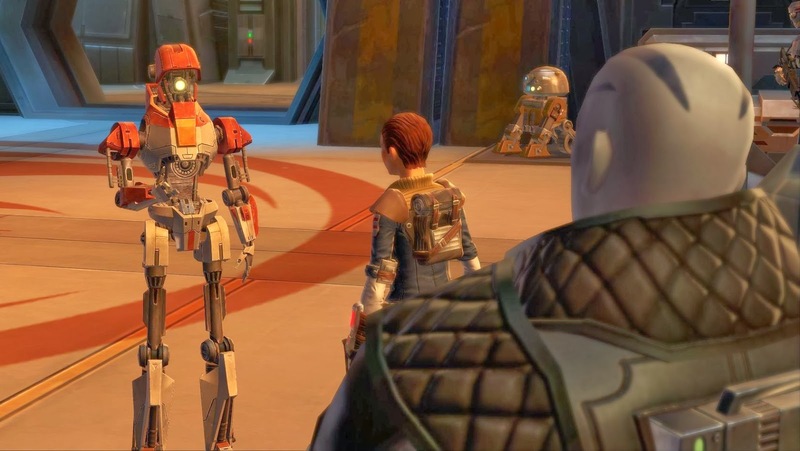 There's quite a few players on the forums pretty psyched-up about this, as they think it could be a sign that they may add Bothans as a playable race. I'd like to add that after you watch the cuts-scene for the intro mission of the FP, you can right click the new GSF companions to get their codex entries. Played through it a few times, first with my 66 Sage. 3 runs, in which I always faced the same sith lord at the end, and saw 4 of the 5 scenarios. Then another 2 times with an imp lowbie (halfway through level 28 at the time) and saw the jedi equivalent and the grenade guy. Also saw the missing 5th scenario then. Those two runs brought me halfway through 29. I can't help but thank that, except for the Reputation grind and the achievements tied to the flashpoint, this will get real stale, real quick. Hopefully they will introduce a HM version that still requires the normal setup, like they have with the Czerka flashpoints, that provides a challenge for level 55 characters.